It was just about a year ago when 30 MB/s was not only acceptable, but pretty much the norm when it came to USB flash drive speeds. USB 3.0 changed all of that, and today most drives can actually function at a rate of up to 100 MB/s. The second quarter of this year, that speed is on the fast track to become outdated. 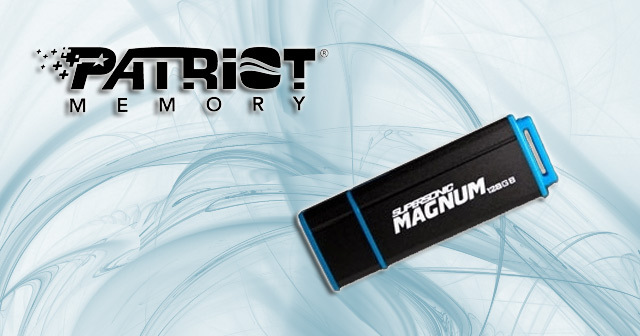 Patriot Memory is known as a pioneer in the high performance memory arena, and they are demonstrating that expertise with the Patriot Magnum flash drive, expected to be released in the near future. The Patriot SuperSonic Magnum USB 3.0 Flash Drive may not look too special, with its simple black and blue casing, but this is one instance where judging a book by its cover is definitely a mistake! This bad boy doubles that 100 MB/s standard, clocking in at about 200+ MB/s read and 110 MB/s write! Patriot’s 8 channel architecture is to thank for this booming speed. Numbers aside, the Magnum 3.0 USB drive functions faster than several internal hard drives. We thought Patriot was doing okay with its original SuperSonic USB drive, which measured in at about 70 MB/s. Now a person can conceivably download 100 GB file in just 10 minutes—meaning that large sequential file transfer speeds and small file speeds just rose exponentially! While it has been said that many folks will not be able to use this flash drive because they are still functioning with 2.0 systems, there is still a market with people who are just itching to have the newest technology. Others say the aluminum casing is too big. However, there are not many other comparable products with these speeds offering the same portability. The Patriot USB 3.0 drive will be available for purchase in both 64GB and 128GB capacities. The price, as of yet, is unknown. While there is no doubt that a nice, large price tag fits its specifications, Patriot is known for their aggressive pricing. Don’t be surprised if this supersonic–magnum-fast USB flash drive is far more affordable than its competitors. Does the potential speed and performance of the Patriot SuperSonic Magnum 3.0 Flash Drive entice you? Talk to us about what you like and don’t like. This entry was posted in Articles, Patriot, SuperSpeed USB 3.0, USB 3.0 Flash Drives, USB Devices, USB Flash Drives and tagged Magnum USB 3.0, new Supersonic Magnum with USB 3.0, Patriot, Patriot Magnum USB-3.0 Flash Drive, Patriot Supersonic Magnum, Patriot USB 3.0 drive, SuperSonic Magnum USB 3.0, SuperSonic Magnum USB 3.0 Flash Drive, USB 3.0 Flash Drive. Bookmark the permalink.